Brief：A Chinese investor group has sold one of the most desirable properties in the country toWanda Group, China's largest property developer.The $420-million deal clears the way for a long-planned luxury condominium and retail development on the former Robinsons-May department store site on Wilshire Boulevard in Beverly Hills. Underscoring the rapidly growing influence of Asian investments in the region, a Chinese investor group has sold one of the most desirable properties in the country to a development firm from China. The $420-million deal clears the way for a long-planned luxury condominium and retail development on the former Robinsons-May department store site on Wilshire Boulevard in Beverly Hills. The transaction — one of the largest in recent years — comes as Asian investors, mostly from China and Singapore, are buying existing buildings at an increasing pace and starting to do their own new large-scale development. This was an opportunity to develop a high-profile, entitled property located in one of the most recognizable cities in the world. Asian investors spent $1.3 billion on Los Angeles buildings in the first half of the year, surpassing the $795 million they spent on buildings there in all of 2013, according to real estate brokerage CBRE Group Inc. In the Beverly Hills deal that closed Wednesday, the eight-acre former department store site was sold by a group of investors led by Hong Kong private equity real estate firm Joint Treasure International to Wanda Group, China's largest property developer. The sale price was not disclosed, but real estate experts familiar with the transaction who were not authorized to speak about it publicly valued it at around $420 million. Joint Treasure bought the property for $148 million in 2010 and said it intended to complete an existing plan to build 235 condos on the property designed by Getty Center architect Richard Meier. Meier's design includes underground parking for 876 vehicles and nearly 21,000 square feet of shops and restaurants. Demand for condos has recovered from a plunge after the economic downturn, said Thomas W.L. Yiu, a senior adviser at Joint Treasure who spoke in a phone interview from Hong Kong. "Things have changed in the past two years" in California, he said. "We still believe very much in the opportunity to sell the property on a condominium basis." The opportunity to sell the land, though, was too attractive to pass up, Yiu said. "We never fall in love with real estate," he said. "When given the opportunity to build or sell outright, we chose the path of selling outright. We were very happy with our return." Wanda Group said in a statement that it would break ground on the Meier-designed project next year. "This was an opportunity to develop a high-profile, entitled property located in one of the most recognizable cities in the world," said real estate broker Laurie Lustig-Bower of CBRE Group, which represented the sellers with brokerage Savills Studley. City construction approvals were secured by a previous owner, and Joint Treasure demolished the former Robinsons-May structure in July. The site is near the busy intersection of Wilshire and Santa Monica Boulevard across the street from the Los Angeles Country Club. Next door is the landmark Beverly Hilton Hotel. The hotel's owner is working on adding a Waldorf Astoria hotel to his property that would open in 2017. 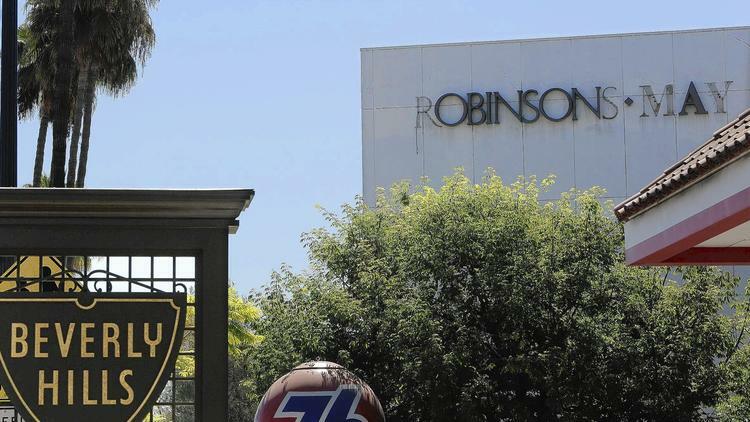 The Robinsons-May site generated about 20 offers from domestic, Middle Eastern and Asian bidders, broker Robert Stamm of Savills Studley said. Asian real estate buyers looking abroad tend to favor cities that they know well through reputation or travel, said Marc Giuffrida, an analyst of Asian capital markets for CBRE Group in Singapore. "Asian investors continue to show a strong preference for trophy assets in global gateway cities," Giuffrida said. New York and London are top choices for buying existing properties, but now Chinese developers are targeting the U.S. West Coast and east coast of Australia for new construction, he said. In downtown Los Angeles, Shanghai-based Greenland Group recently broke ground on the first phase of a $1-billion condo, hotel and retail project called Metropolis. Korean Air is well underway on the $1-billion Wilshire Grand hotel and office skyscraper a few blocks away, and in January Chinese property developer Oceanwide Real Estate Group acquired a sprawling parking lot across the street from Staples Center where it hope to build a large-scale residential and retail complex. Another Asian investor has a downtown property in escrow at Grand Avenue and Cesar Chavez Boulevard, CBRE Group said. Chinese developers such as Oceanwide, Greenland and Wanda are unfamiliar to most U.S. residents but are well-established brands at home, Giuffrida said. "These groups have become big in Asia," he said, "and are now projecting their brands on a world stage."